Scotland’s first Low Emission Zone (LEZ) came into effect in Glasgow on December 31, 2018 – this LEZ covers areas of the Glasgow City Centre. This first phase of the LEZ will see new European emission standards coming into effect and means at least 20% of the buses driving throughout the City Centre must comply with these standards. This means that one in five buses will be using routes within the LEZ and must conform to the regulations and the details of vehicles violating the standards will be captured through ANPR (Automatic Number Plate Recognition) cameras in order to regulate this new change. The implementation of the second phase, which is being planned for December 2022, requires all vehicles entering the LEZ to comply with the specified European emission standards. The quality of air in Scotland remains a cause for concern for its residents. The poor air quality, which mostly affects the elderly, younger population, and those already suffering from medical issues, is caused majorly by road transport. Removing vehicles contributing to pollution on the roads. Compelling vehicle users use low-emission vehicles. Motivating people to use public transport instead of cars. Cars contribute to 60% of emissions of greenhouse gases by road transport whereas buses and coaches amount to less than 5% of the emissions. Glasgow City Council believes that the LEZ approach is an efficient way to reduce pollution in the City Centre area significantly. The phased approach, the local authorities believe, will give enough time for residents and businesses to prepare themselves for complying with LEZ standards. This phased approach is expected to establish a cleaner city with cleaner vehicles and improved air quality. Plans are underway to introduce more LEZs in other major cities of Scotland including Dundee, Edinburgh and Aberdeen by 2020. How Transport Companies are Contributing? 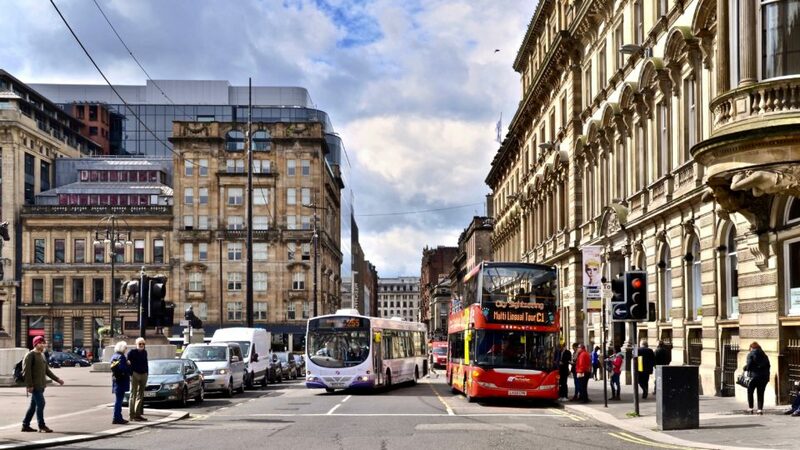 First Glasgow, Scotland’s largest bus company, has introduced 75 new ultra-low emission vehicles into its fleet to comply with the first phase of LEZ requirements. The company, which covers the Greater Glasgow area, plans to follow-up the initial strategy with another 75 ultra-low emission vehicles, to be introduced in 2019. The company also aims to encourage the use of public transport by making the latter more attractive to the public. The company has introduced measures such as mTicketing, journey planning apps and contactless payments to make bus journeys faster and easier. With greater awareness, it will be easier and smoother for businesses and the public to adapt to the LEZs. Signboards have been put up along the LEZ area to raise public awareness. These signboards offer advisory for motorists and other vehicle users regarding the presence and the requirements of LEZ. Plans are also on to make businesses and individuals aware of the next phase due in December 2022. A dedicated group including the Glasgow City Council is working to make the current and future LEZ processes smoother, efficient and hassle-free for the public and businesses. London is also looking to implement its Ultra Low Emission Zone (ULEZ) standards. The ULEZ is all set to be implemented on April 8, 2019, in the central London Congestion Charge Zone. Vehicles will be required to comply with tighter exhaust emissions standards, failing which, they will need to pay a daily charge (charges vary depending on the type of vehicle). Sadiq Khan, the Mayor of London, has urged motorists to check if their vehicles meet the specified standards so that they are well-prepared for the ULEZ restrictions in April. Carryway is a trusted partner for smart service vehicles. We are specialists in compact electric vehicles and offer a range of fully electric vans, shuttles and pickups ideal for reducing your inncercity fleet emissions. We are an official dealer for Club Car, Esagono and Garia. So, whether you are looking to purchase or hire EV’s we will have an option to suit. Looking to prepair your fleet for the LEZ? Contact the Carryway team today to discuss how we can help.